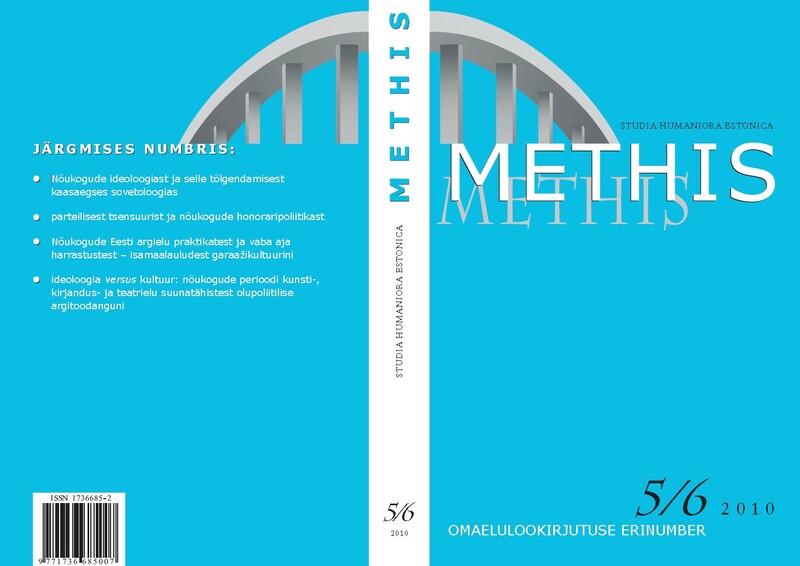 The introductory article provides a conceptual background of the special issue of Methis focusing on the role of “life writing” (omaelulookirjutus) in Estonian cultural history, examining it from the perspective of different disciplines and theoretical and critical frameworks. Functioning as an umbrella term for the issue, omaelulookirjutus is largely a synonym for the term “life writing”. While referring, in its widest usage, to a diverse body of texts that take life as its subject, the gradual adoption of the term life writing to refer both to a field of study and its subject also denotes a self-conscious turn away from a more narrow notion of autobiography. In European cultural contexts of a certain time period, autobiography conveys certain conceptions of the nature of truth and selfhood (the Enlightenment subject). Life writing, on the other hand, can be understood as a concept that facilitates a wide range of textual practises, both literary and nonliterary, that represent a diverse array of cultural contexts and categories of identity. The Estonian near equivalent of the term life writing, omaeluloolisus, is used with regard to the conceptualisation of the term by Jaan Kross, a canonical Estonian contemporary novelist in his Omaeluloolisus ja alltekst (Autobiographism and Subtext, 2003). Although mainly an attempt at constructing a systematic interpretational frame for the consideration of the trajectory of his own work, Kross’ observations have wider implications, addressing some central concerns of the development of Estonian life writing. Delineating a scale of manifestations of “the autobiographical” (omaeluloolisus) in the literary work of an author and the autobiographical essence of language, Kross also makes visible its functioning and uses as a socio-politically charged entity in everyday contexts, in particular with regard to the experience of the Soviet regime. In its wide range of manifestation and application possibilities, omaeluloolisus, as outlined by Kross, in many aspects relates to the conceptualisation of life -writing and life narrative by Sidonie Smith and Julia Watson, the notion of “the autobiographical” by Jeanne Perreault and Marlene Kadar, and “autobiographics” by Leigh Gilmore, whose theoretical perspectives have also informed terminological situating processes of Estonian life writing texts and practises in the current volume. Taking as its starting point life writing as an interdisciplinary field of study, this special issue aims at presenting Estonian life writing research from the viewpoint of different disciplines (literary and cultural studies, theatre studies, folklore and sociolinguistics) and different types of texts ranging from the work of canonical authors and lesser-known literary figures to different types of archival material. With regard to life writing studies’ relation to autobiography studies that consolidated in Europe and the USA as a distinct field of study in the 1960s and 1970s, it is important to point out that regardless of the existence of a rich and diverse body of Estonian life writing texts, life writing has so far received minimal systematic critical attention in Estonian literary history and criticism. The special issue aims at advancing the initiatives taken in the field by a number of individual researchers, most of whom are also represented in the current volume. It also aims to facilitate a critical forum for Estonian life writing and contribute to the establishment of life writing as a legitimate object of Estonian literary and cultural studies, aiming for its enhancement in Estonian cultural history.